Last Tuesday I visited the always welcoming Wiltshire Astronomical Society (WAS) for a talk by Mary McIntyre that described the variety of light shows that are created in the atmosphere. I learned that, not only are there the typical rainbows and aurora, but a whole heap of solar halos and arcs depending on the orientation of the thin cirrus clouds that cause the refraction and dispersion. Despite being an active astronomer for some years, I have yet to see an aurora. I guess living in southern England doesn’t help. I was astonished to hear that Mary has seen 5 aurorae in only a few years. While being based slightly further north near Oxford cannot hurt, we are both too far south to make aurora sightings a common occurrence. Obviously, these views and photographs have not come without some effort. She monitors the aurora forecast and is prepared to stay up late and, she was keen to highlight, there have been plenty of unsuccessful attempts. Even so, 5 in a few years is infinity percent better than my efforts. 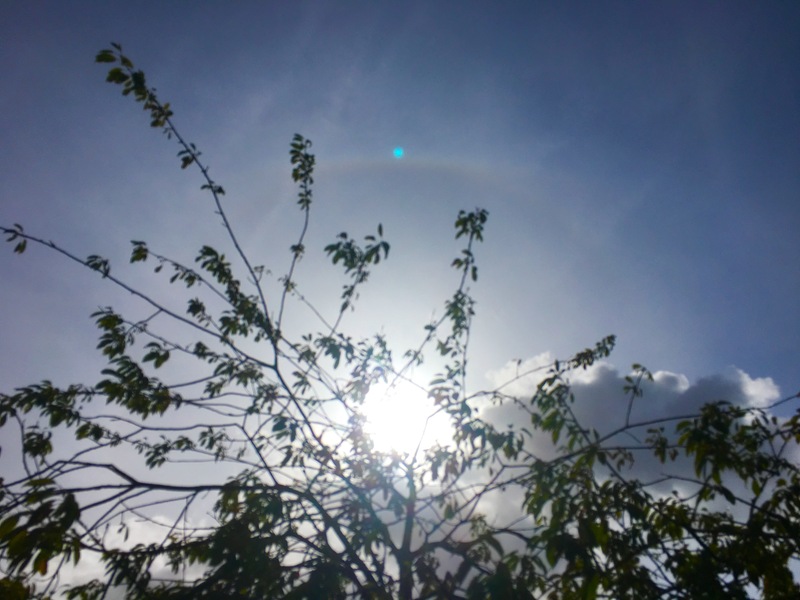 The very next day was sunny but with a thin layer of cirrus that was just enough, to my untrained eye, show a solar halo. With only my iphone to hand, I took a quick snap which, after posting it on FB, I learned that not only had I picked up the obvious halo, there was also a tangential arc across the upper section of the halo. 1 for 1! Later in the week, the 8 September to be precise, the aurora forecast shot through the roof. Could I get 2 from 2 in only 1 week? Unfortunately, it was still mid-afternoon. Can you imagine it? The northern sky was lit by bright streamers of aurora that could not be seen in daylight. I wanted sunset to hurry up. Sunset in early September still drags on but it felt like it was taking twice as long as usual. All the time, unfortunately, the storm forecast was dropping. What would have made a fantastic display was fast disappearing so, by the time it was dark, the northern sky was barren apart from my familiar constellations and the occasional aircraft. I made a brew and, watched out but could not see anything. There was nothing on the camera preview screen so I decided to call it a night but by this time a waning moon was rising. With the moon drowning out what little glow there could have been I decided to blow my night vision. 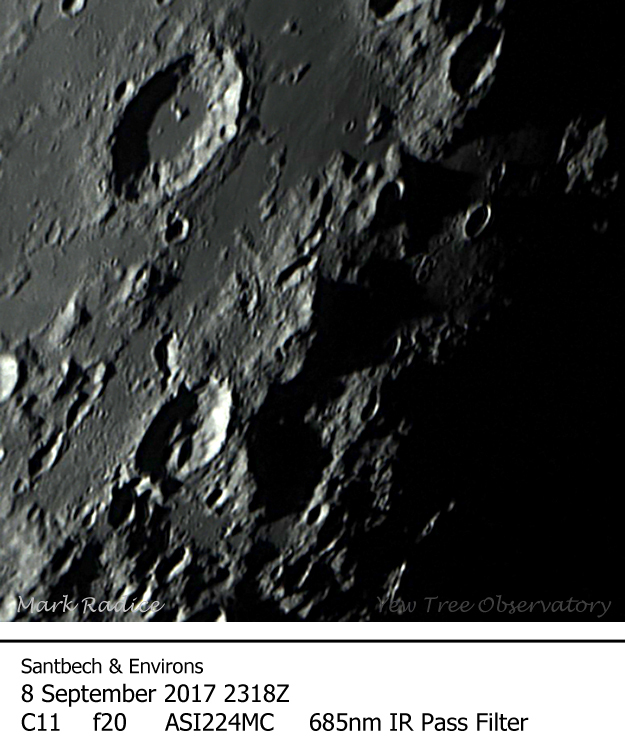 The moon looked stunning in the binoculars so I rolled the C11 out and caught some, compared to my normal efforts, high resolution images. Once again I am so pleased with the simple trolley I made for the C11. It makes setting up and packing away such a pleasure. I don’t miss lugging all the equipment back and forth and am sure it makes impromptu sessions like this a joy. 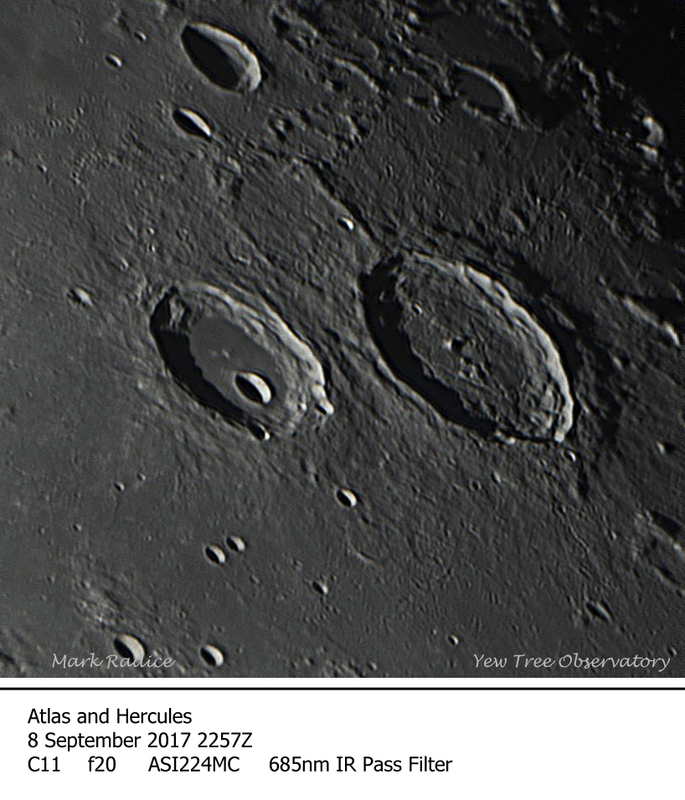 First up was Atlas and Hercules – an interesting crater pair on the edge of Mare Frigoris. Note the interesting rimae on the floor of Atlas that form a V shape. I then swung south and explored the shoreline of Mare Nectaris. 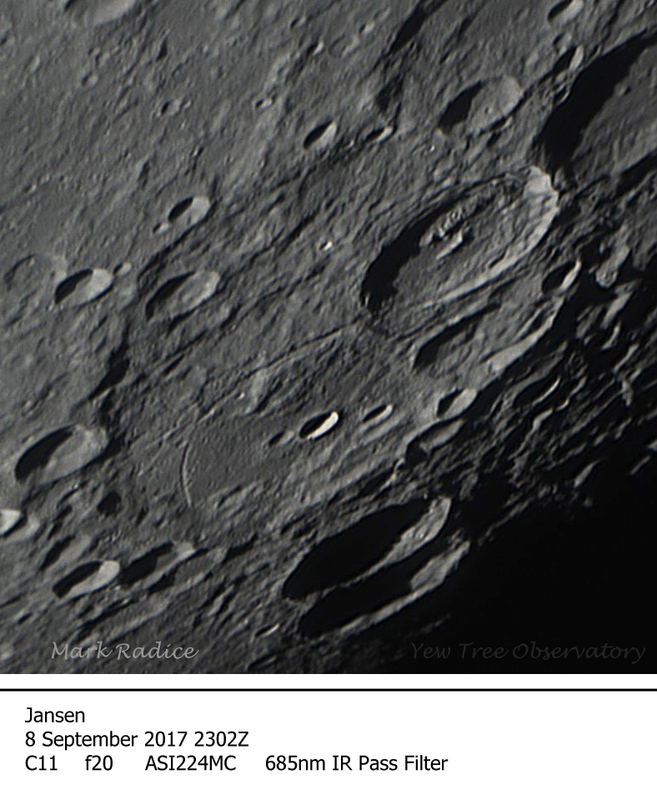 Jansen was an obvious target with its battered appearance and arcing fault on the crater floor. 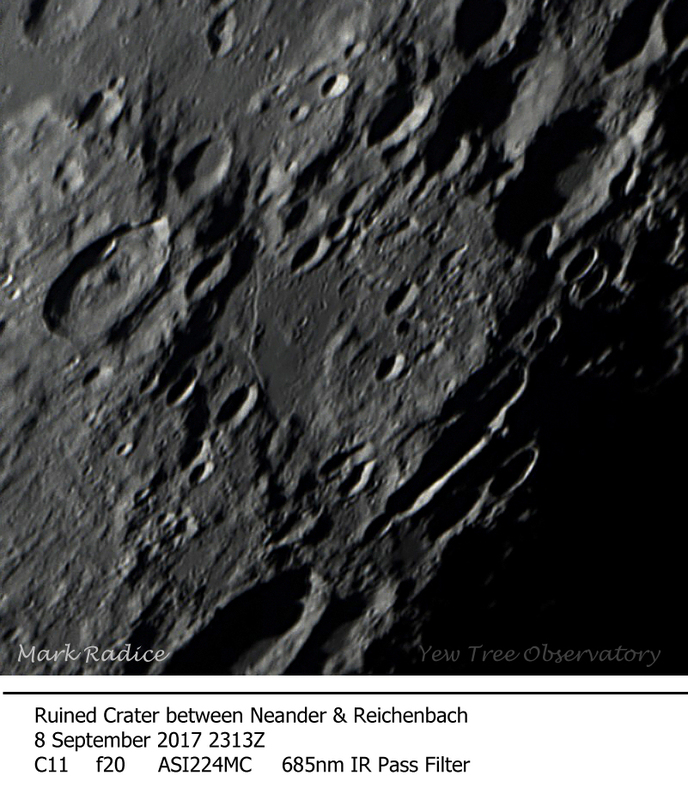 Nearby was an unusual crater I had not noticed before, located between Neander and Reichenbach. 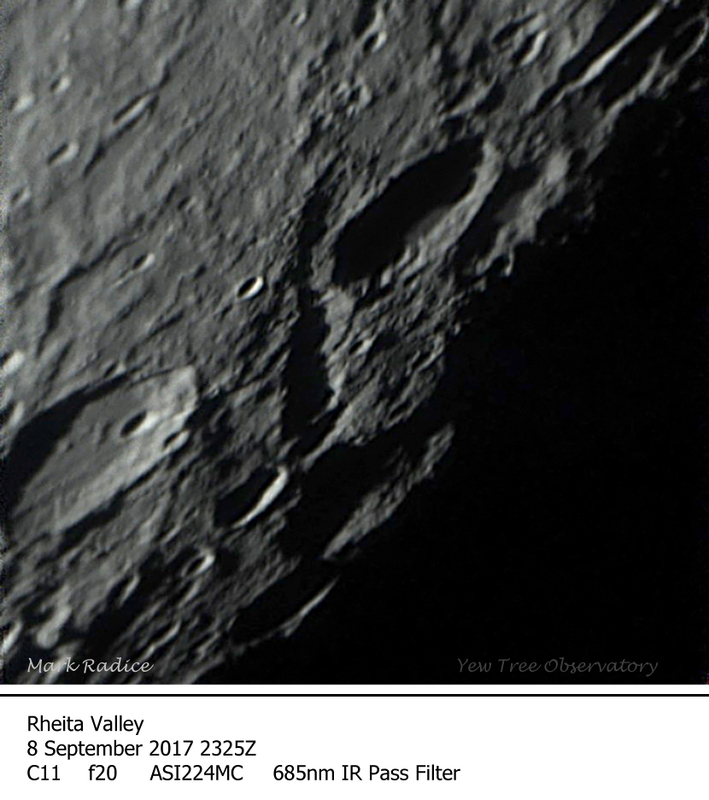 This crater is unnamed in my lunar atlas. It has obviously been battered back and forth as it has a ruinous appearance. It is pretty striking with the terminator in just the right place. Interestingly, it is cut by a rima on its western edge and has a small mountainous ridge running north-south through its centre. Looking at the crater density on the floor, the south west corner is noticeably less cratered that the surrounding terrain. The smooth floor here along with the presence of a rima suggests that this area has been flooded by lava. These thoughts may be further corroborated by the fact this area appears to be much lower than the surrounding crater floor. There was also an interesting isolated peak near the crater Santbech that caught my eye with its shadow cast over stunningly rugged terrain. The Rheita Valley was particularly stunning. Its floor was still in shadow so it looked very striking compared to the surrounding bright terrain. I knew that Uranus was also visible, shining faintly in Pisces. Once I had finished flying over the lunar surface, I launched the telescope towards this distant planet. 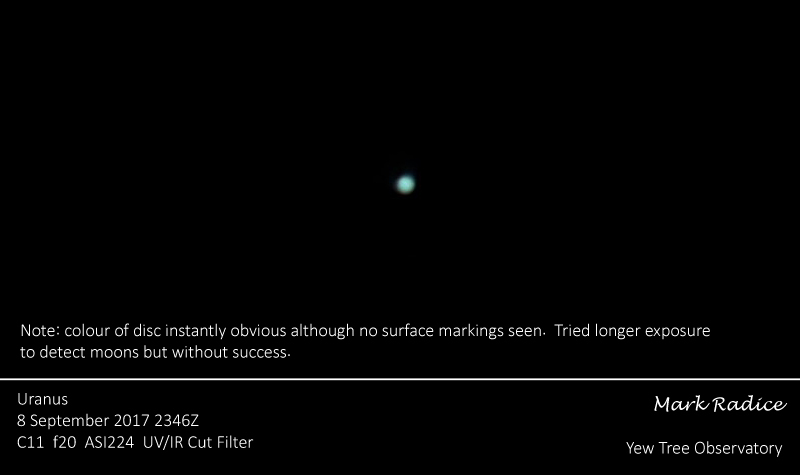 Even at f20 (over 5m focal length!) all that was visible was a beautifully coloured but tiny disc. I tried to pick up the moons with some I second exposures but, having read up after the event, these need around 1 minute to be successful. I am looking forward to further explorations of the Uranian world – and Neptune – using the big telescope while in Tenerife next week.